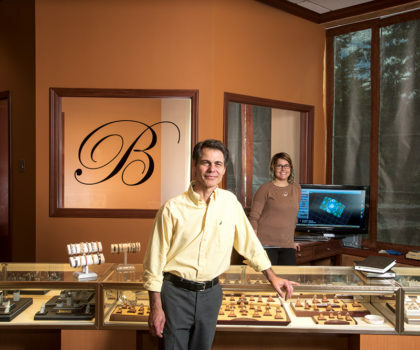 Bella Design Jewelers is a family owned business actively involved in the Cleveland local community for over two decades. We feature a complete range of beautiful diamond and fine jewelry and quality services including custom design. Our Cleveland jewelers specialize in matching your personality and style with jewelry that you will love wearing for years to come. In our Bridal Jewelry section, you can choose from Tacori™ , Simon G. and a diverse selection of other stunning bridal collections. We carry a large selection of loose diamonds from one third carat to 3 carat sizes in a range of colors and clarity grades. Our selection of wedding bands and gifts helps you to fill all your bridal needs. Our Cleveland jewelers enjoy sharing their expertise as jewelers and designers to help you navigate the many details and decisions that will create the best ring for you and for her. For all the special occasions in your life, we have jewelry collections that run the gamut from breezy to elegant. We enjoy helping you find the right jewelry for everything from a last minute gift to a once-in-a-lifetime purchase. We hand select all of our jewelry collections so you can be assured that they are not only beautiful but also well-made. We know you want to enjoy your jewelry, wearing it often and without worry. We are proud to support local and national artists in our store by showcasing their work as part of our giftware selections and during our special events! Bella Design Jewelers offers on premise jewelry services including custom design, remounting, repairs, engraving, appraisals, inspections, complimentary cleaning and polishing. At Bella, we do all we can to ensure that your experience is stress-free and enjoyable. We look forward to seeing you at Bella! I have been in the Cleveland area jewelry industry since 1979. My first ten years were spent as an apprentice at a Cleveland jewelry manufacturer where I developed my skills as a jewelry artisan. In 1989 I opened White Design Jewelers as a wholesale custom design shop. Joann has over thirty years experience in the jewelry world. She started as a giftware buyer for Cowell and Hubbard, a Cleveland landmark. She transitioned into jewelry sales. During her career, she has opened and managed a number of stores. Helping customers with custom design, particularly redesigning inherited jewelry, to create a new piece that's loved, is one of Joann's favorite parts of her job. But what Joann enjoys most about consulting with customers about their jewelry purchases is that she gets to be part of life's special moments. Of course, needless to say, she finds engagement ring consultations very gratifying. Lisa has known Rock for many years and worked for him at White Designs. Her primary focus at Bella is creating events for Bella’s customers that are not only fun but also make their jewelry purchases easy and relaxed. Lisa is a certified business coach and maintains a coaching practice, Life Leadership Alliance. She has over nine years jewelry manufacturing and repair experience. Trained in CAD-CAM Design, Elizabeth works closely with Rock White on custom jewelry designs. Elisabeth grew up in the jewelry business; her father is a career goldsmith. She enjoys her work and aspires to completing a degree in studio art or fashion design. William is an accomplished bench jeweler with a breadth of experience in everything from jewelry repairs to custom design. He trained in California at the Revere Academy, and has over 25 years of experience at the bench. Scott has over thirty-seven years of experience in the Cleveland jewelry industry and brings an enormous amount of expertise to our customers. His knowledge of diamonds and colored gemstones is extensive and he enjoys consulting with customers interested in custom design. He has served on the board of the Mid-America Jewelers Association. Scott is an active supporter of Cleveland charities, most recently the Christ Child Society of Cleveland. Pam is a Graduate Gemologist with many years experience. She was trained by the Gemological Institute of America (GIA), the most widely respected gem grading laboratory in the world.